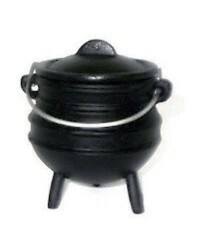 These cast iron witch cauldrons are food safe for ritual brews, potions, or natural healing remedies for Witchcraft and other ritual use - or dinner! 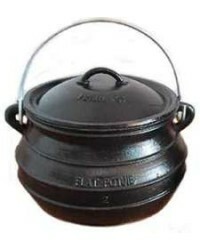 Many cast iron cauldrons sold for Witchcraft and ritual use are not food safe - their cast iron might contain impurities you should not use for anything that is going to be ingested. 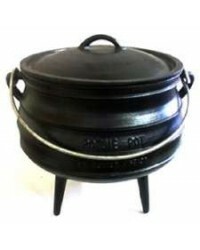 This section contains cast iron cauldrons which are 100% food safe without those harmful metals and toxins. These cast iron cauldrons are carefully made and pre-seasoned with flaxseed oil (they come with care instructions and how to re-season them if needed). You can use them to safely stew and brew any potions to be ingested or your favorite meal for a magical dinner. Simmer with herbs to make infusions for natural healing or magickal potions. Most come complete with lids and handles in the traditional and iconic pot belly shape (which is also great for evenly dispersing heat). Feed your family or your Witch's soul with our cast iron cauldrons.